This is wonderful - I love the woven illusion and these are great fabrics! Another inspiring quilt - and a great way to use up scraps from your last quilt! 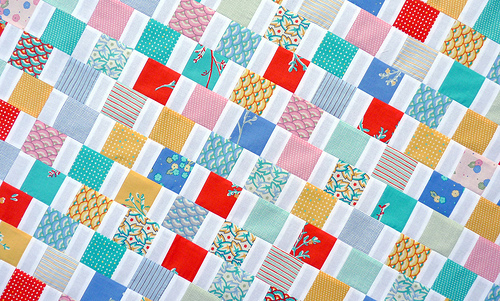 I've got some of the City Weekend fabric in my stash to make a unisex baby quilt so I might have to give this a go. Love what you did with the City Weekend fabric. I have to say since I've seen your City Weekend posts, I bought mine! And I really like this quilt. Thanks for these great quilts and your great blog. Mi piace per la vivacità dei colori! In keeping with the wordless theme. More wonderful designs using City Weekend. Just gorgeous. Wow, you've been busy - wonderful look! beautiful as always! Your piecing just blows me away with its impeccable quality~! oh wow, thats gorgeous... one of these days i need to try doing something on an angle, looks so good! Beautiful job, as usual. 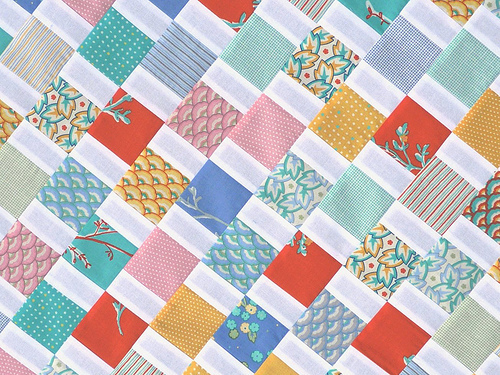 I just love your straight-line and grid quilting. How long a stitch length to you generally use? Very, very pleasing to the eye. A nice change from the typical "checkerboard" pattern.